Many do and the cloud currently is populated online storage services like Dropbox and SkyDrive, Microsoft’s cloud-centric Office 365 Home Premium, and Google’s Chromebook push. There’s even some speculation that Windows could one day become an online service. As with previous versions of SpiderOak, you can also access your files on mobile devices. As part of the SpiderOak Hive roll out, the company has a new Android app coming your way next week—we’ve got a sneak peek at the latest beta version. Hive has already been available for about a week. Starting Tuesday, however, when new users download SpiderOak, they will get 5GB of free online storage for a limited time instead of the company’s usual 2GB allotment. Hive may sound like every other sync service out there, and in some ways it is, but the difference with SpiderOak Hive is the company’s commitment to zero-knowledge encryption for your data and password. “One of the impetuses behind Hive,” SpiderOak CEO Ethan Oberman told PCWorld “was providing people with an easy way to approach [to data] privacy in a way they’ve already understood with cloud-storage services.” The means applying SpiderOak’s zero-knowledge capabilities to the drag-and-drop functionality of services like Dropbox, Google Drive, and SkyDrive. SpiderOak uses a combination of 2048-bit RSA and 256-bit AES encryption to ensure your data is locked up tight and only you have the key—which is your password. The problem is that, unlike other online services, SpiderOak cannot retrieve your password for you should you forget it. It’s easiest to think of SpiderOak as having two components: Hive for quick sharing and sync, and a back-up application for critical files you don’t want to lose, such as family photos. After the installation process, you have to sign in with your SpiderOak account credentials and then assign your PC a name. If you’re a current SpiderOak user, the app will then sync information about your other PCs that have SpiderOak installed. You will also see a new SpiderOak Hive folder alongside your Dropbox and Google Drive folders inside Windows Explorer. As part of Hive and SpiderOak 5.0 for Windows, the service includes a new right-click menu when you’re inside the Hive folder. The menu feature quick access to SpiderOak’s sharing- and version-history features. Right-click any file outside of Hive and you get an option to back it up in SpiderOak. You can’t use the right-click menu to share or back-up folders, but you can do both using the SpiderOak back-up app installed alongside Hive. 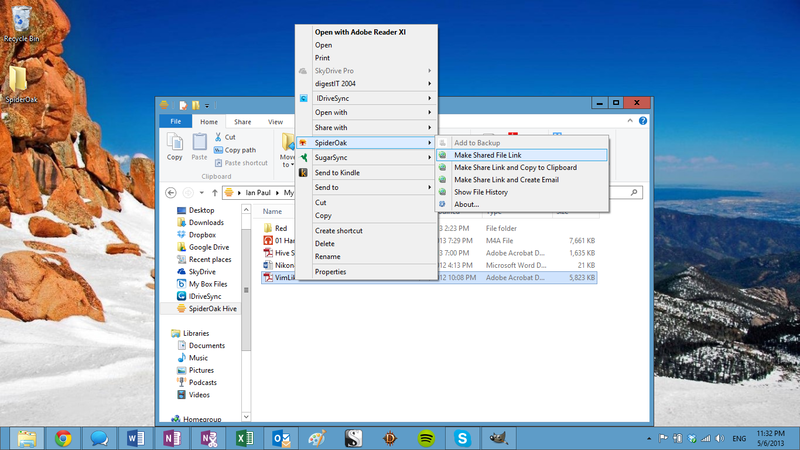 The right-click menu is currently available for Windows, and similar features are also headed to Linux and Mac in the coming months. Also coming soon from SpiderOak is a newly designed Android app written in HTML5—SpiderOak 2.0 for Android—that complements the new Hive features. It may raise some eyebrows to Create an HTML5 app in a time when apps written in native code are considered superior. This is especially true since Facebook CEO Mark Zuckerberg said in September that using HTML5 as the basis for Facebook’s mobile apps was the biggest mistake the company ever made. Facebook’s HTML5 apps were notoriously slow. Oberman shrugs off these criticisms about HTML5. “Every situation is different,” he said. “You’ve got to choose the technologies that work best for your use case.” SpiderOak plans to launch the new app next week for devices running Android 2.3 and up. SpiderOak’s upcoming Android app is very similar to its newly revamped iOS version that launched in late April. At the top of the Navigation drawer, you’ll see your Hive folder, followed by a list of your SpiderOak-connected PCs. As with the new iOS version, SpiderOak for Android includes a small icon next to each PC to denote whether it’s a Linux, Mac, or Windows machine. Below your connected devices, you’ll see access to ShareRooms, Favorites, Recent files and folders, and app settings. 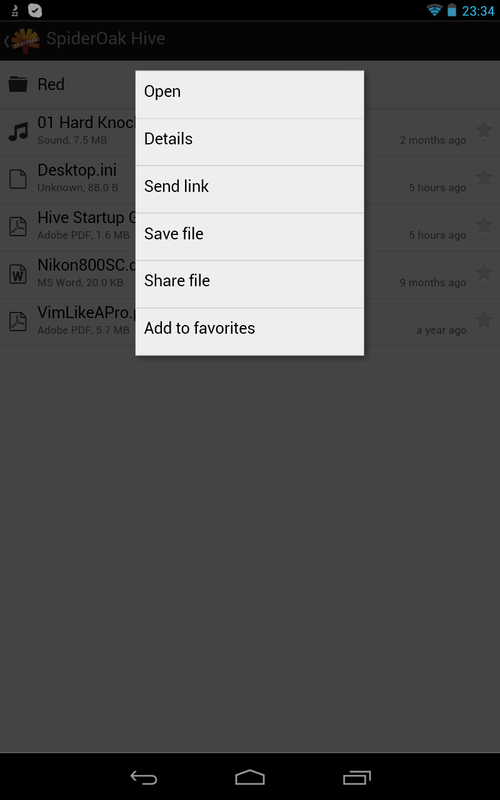 Long press a file in the SpiderOak Android app and a menu pops up. SpiderOak’s mobile apps don’t offer any kind of media support such as music or video streaming, and the Web version doesn’t offer features such as online-document editing.